Spread over the area to the north, east and south of the city, the Jerusalem Hills are one of the most picturesque parts of the country throughout the year. Locals and tourists alike flood the hills on weekends and holidays for hikes, picnics, sightseeing and much more. While nature is the biggest draw, as long as you’ve made the trip, you won’t want to miss out on the charming restaurants spread about in Nes Harim, Shoresh and other small towns in the Jerusalem Hills. The charming Pichonka restaurant is located in Nes Harim, one of the most picturesque villages in the Jerusalem Hills. The varied kosher menu includes meat, fish, salads and breakfast all at reasonable prices, which you can enjoy while overlooking the lush green landscape, mountains and streams of the Jerusalem Hills from the restaurant’s massive patio seating area. Pichonka also hosts group meals and events up to 400 people. 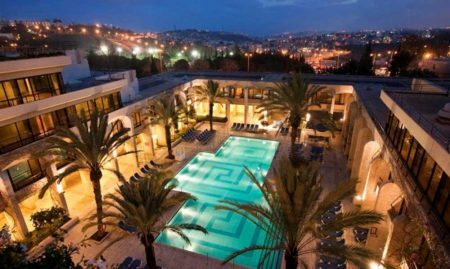 In the heart of the magical Ein Karem neighborhood, you will find the luxurious Alegra Boutique Hotel that offers absolutely breathtaking views of the Jerusalem Hills and houses one of the most chic restaurants one can find in Jerusalem – SEASON. The restarant’s concept is pretty simple: a tasting menu of 8 courses that lasts for about 2.5 h at the chef’s table. As simple as it sounds, we’re talking about one of the most exclusive and fascinating experiences that you’ll ever have. SEASON’s kitchen is based on fresh ingredients and high-quality wines that are paired with the particular menu that’s on the table. For those of you who are looking for a more intimate experience, there’s also an option of sitting at a private table. If you want to soak up some of that fresh Jerusalem air, the restaurant offers a beautiful balcony with panoramic views on the mountains. Perhaps the most popular and well-regarded restaurant in the Jerusalem Hills, Rama’s Kitchen in the town of Nataf attracts diners from all over the country. The restaurant has been around for over 20 years, serving the highest standard of home-style cooking with a touch of Arabic and French cuisine. The lunch and dinner menu consists of various meat, fish, delectable vegetable dishes and fresh flatbreads straight from the taboon oven, but if you get there early(-ish), you can also sample from their rich brunch menu. Rama’s Kitchen is only open on the weekends for brunch, lunch and dinner, but during the week it’s available for private event bookings. Just outside of the famous village of Abu Gosh you can find Majda restaurant in a charming old house in the village of Ein Rafa. Majda serves up gourmet-style, locally-inspired cuisine, including dishes like slow-cooked lamb over couscous, chicken pastilles, sea bass stuffed with mangold leaves and klamata olives and twists on classics like shrimp falafel, among other inspired items made only from the freshest local ingredients. Majda is open on weekends starting Thursday afternoon, and Friday and Saturday you can indulge in some weekend brunch. Aside from its tantalizing menu, gorgeous views and welcoming atmosphere, Majda is also well-known for its appearance on the popular television show Anthony Bourdain: Parts Unknown. Located in the village of Kiryat Anavim, Muma combines a unique design with delicious cuisine to create a special dining experience. In addition to a varied menu of meat, seafood, fish, pasta, vegetable dishes and more, Muma also hosts live music on Tuesdays and other nights, depending on the week. Moma is named after the son of Eliezer Ben Yehuda, the father of modern Hebrew, and the owner’s grandmother. In the village of Shoresh, west of Jerusalem, you can find Musa Bahar. The restaurant is known equally for its fine French-inspired cuisine and it’s breathtaking panoramic view of the Judean Hills. We recommend going on a warm and clear day, so that you can enjoy your meal on the restaurants luxurious patio with a prime view.